The following is list compiled by Steve Smiley that can be found in his book, "Playing For Coach Meyer." Steve is currently the head coach and athletic director at Sheridan College. 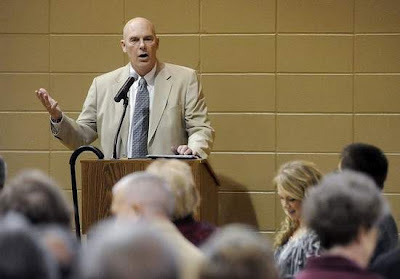 His book deals with the life lessons he garned while playing for Coach Don Meyer at Northern State University. The past few evenings I've been re-reading some of my notes from "Good To Great," the outstanding best-seller by Jim Collins and thought I'd share some of those notes concerning Level 5 Leadership. This book was not written by a basketball coach or with a basketball team in mind. It was written about what it takes to move an organization from mediocrity towards achieving its potential. Sounds like what most coaches want to do with their teams! “Good is the enemy of great." That simple beginning had me hooked from the start. We have all coached players or teams that were good but couldn’t get over the hump to become great. They are satisfied with good — good seems, well good! Obviously, as is often the case, the youth that we must teach and coach are the byproducts of the culture of our time and Collins points out that many organizations are caught up not being able to stretch to their potential. 1. Channel their ego needs away from themselves and into the larger goal of building a great company. 2. Have unwavering resolve… to do what must be done. 3. Are fanatically driven, infected with an incurable need to produce results. They will sell the mills or fire their brother, if that’s what it takes to make the company great. 4. Look out the window to apportion credit to factors outside themselves when things go well (and if they cannot find a specific person or event to give credit to, they credit good luck). At the same time, they look in the mirror to apportion responsibility, never blaming bad luck when things go poorly. -Creates superb results, a clear catalyst in the transition from good to great. -Demonstrate an unwavering resolve to do whatever must be done to produce the best long-term results, no matter how difficult. -Sets the standard of building an enduring great company; will settle for nothing less. -Looks in the mirror, not out the window, to apportion responsibility for poor results, never blaming other people, external factors, or bad luck. -Demonstrates a compelling modesty, shunning public adulation; never boastful. -Acts with quiet, calm determination; relies principally on inspired standards; not inspiring charisma, to motivate. 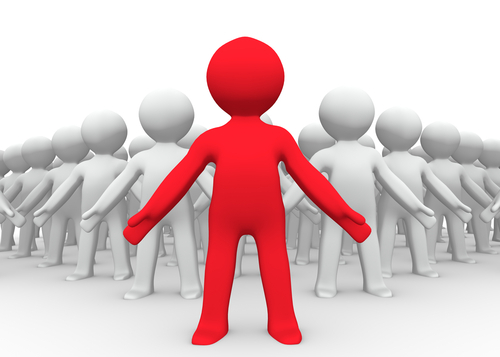 -Channels ambition into the company, not the self; sets up successors for even greater success in the next generation. -Looks out the window, not in the mirror, to apportion credit for the success of the company- to other people, external factors, and good luck. JACK RAMSAY: "Determining his philosophy is, therefore, a coach's primary task; he must decide, before anything else, what it is he wants to say of himself through the game." JON GRUDEN: "Teach your players how to practice. That's even more important than teaching them what to practice, because if you don't establish the pace you want and if you aren't consistent about it, they're going to work the way they want to and it's going to change with each day. You have to let them know that you want them practicing with a sense of purpose, every time." DALE BROWN: "The greatest of problems is the greatest of opportunities." VINCE LOMBARDI: "Success demands singleness of purpose." This is somewhat of an unusual book review for a coaching/teaching website but when you think about it, much of coaching comes down to marketing. "Selling The Invisible," by Harry Beckwith may not be a book that a normal coach picks up to read but think about it -- how do we market our concepts that we want to get across to our players...to the media...to our fans…to the administration? The title itself says a great deal about coaching — "Selling The Invisible." Getting our players to envision how a good possession will look or how a good season will feel...get your fans to buy into your vision for the future of your program...and certainly if you are on the collegiate level, recruiting is all about selling the invisible. It should also be noted that as coaches we should feel some responsibility to help market our program and get people in the seats. We should be part of the solution as opposed to being part of the problem. We need to understand that while we want to teach our players how to play we also need to help grow the game — regardless of what level we are working. In repeated studies, people were shown a sequence of items—pictures of an apple, pear, peach, prune, and pomegranate, for example—are most apt to remember the apple and the pomegranate. They remember the first and the last items but forgot the middle. Your first comment to your player(s) is going to register. The last comment is going to stick. Plan according for more effective communicating. How much time do you spend thinking about how you are going to address your team on a daily basis? At a very early age in my coaching career, my mentor and junior high coach Allen Osborne, allowed me to travel with him to visit college programs to observe practices. 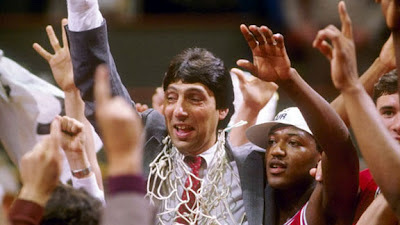 I remember watching Indiana practice with Bob Knight. The Hoosiers came out for pre-practice ran by the assistants and then Coach Knight would called them back to the locker room for a short talk that might include video. At North Carolina, they would start with station work followed by Coach Dean Smith walking to center court and going over an emphasis of the day and a thought for the day. I guarantee you that both gave great thought to what those opening comments were for their team. It was early in the practice session, their team was fresh and attentive -- so what message was prevalent in their thinking to give to their team. On the other end, practice is over -- whether it's been a good practice or a rough one -- and the team is gathered to hear your thoughts. What's the last thing you tell them? It's important. It can go a long way in framing the next practice you have or framing their thoughts for the game tomorrow. I had the great honor of working for Coach Dale Brown at LSU for 13 year -- what a communicator! As much as possible he prepared his thoughts before speaking to his team. He was also a great story teller. Stories paint pictures to help with communication. I only wished we could have video taped some of those team meetings. He always had a goal to accomplish in each meeting and planned accordingly. Timeouts are critical. 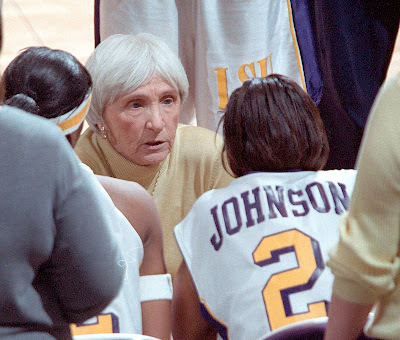 Sue Gunter, another Hall of Fame coach that I was honored to have worked for was the best time-out coach I've been around. She kept her thoughts short and to the point. When the team first came off the floor from a timeout she would either praise or correct the previous possession (while it was fresh on their mind). She would then give them one central thought that was important to the flow of the game. Finally, she would close with specific instructions regarding whatever phase of the game we would immediately be involved in coming out of the timeout. She could put on a mini-clinic in a timeout -- short, simple and to the point. How you communicate with your team is important -- of course you already know this. But how much time do you think about improving your communication plan of attack? I'll bet every coach takes great time and thought in putting together their words for the first team meeting of the year. How about the second team meeting? Or the 12th team meeting? You want your team's best on the first game, the second game and the 12th game so they should get your best in the organization of your team meetings. Coach Brown and Coach Gunter were also masters of the pre-game talk. I often saw them jotting down or going over notes to prepare their pre-game message. They knew how to frame a game. I'm not talking about rah-rah stuff but finding a way to simply get across the key concepts needed to succeed. Half-time. What does your team need? Just because you played poorly doesn't always mean that you need to rant and rave. The best coaches have a great sense of exactly what is needed. Even on the occasions where you might have to blister your team for a lackluster performance in the first half, the best coaches know how to calm it down and sum it up for their team before sending them out for the second half. If your team played well it's important to keep them in the "middle of the road" -- they must be reminded there's 20 minutes left and, more importantly, the keys to winning those 20 minutes. What about post game? Probably one of the worst things you can do as a coach is go off on a team immediately following a poor outing. This becomes more of an emotional outburst as opposed to an intellectual one. That's not to say you can't let your team know of your disappointment but you'll be better off to show film the next day to have visuals to go with your voice. I always think after a loss you have their attention more than after a win -- make it count. It's also just as important to say the right thing after a win. Again I refer to Coach Gunter who was simply a great communicator. She had a three-prong message after wins. #1 She always wanted to compliment the team for winning -- no matter how ugly. She also always went out of her way to compliment at least one role player. #2 She always pointed out something we needed to improve upon -- no matter how well we played. #3 She always mentioned our next opponent. It was her subtle way of planting a seed before they left that it was on to the next games. In fact, one of Coach Gunter's most often repeated phrases was "The only game we can do anything about is the next one on our schedule." 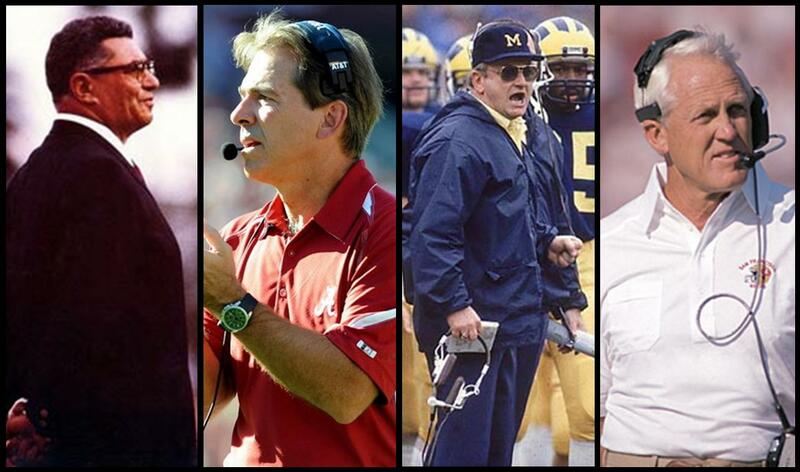 WOODY HAYES: "There's nothing that cleanses your soul like getting the hell kicked out of you." MIKE KRZYZEWSKI: “My primary task is motivation. How can I get a group motivated, not only to be their individual best, but able to become a better team. I have always said that 'two are better than one, but only if two can act as one.'" This came this morning from Don Yaeger's facebook page and I thought it was priceless -- so much that not only I'm posting it here but going to put it on my HoopBoost for Players blog as well! LOVED THIS! So as we were wrapping up the National Player of The Year presentation to Anthony Davis, a father and son approached Davis's parents and the father asked Mr. Davis if he could offer any advice that might help his 11 year old become as special as Anthony. Mr. Davis said: "Listen to you father...and appreciate that he's part of your life. Not enough young men like you have that. Let that give you an advantage." As they walked away, the father had a tear in his eye. Nothing better than those unscripted moments. PETE NEWELL: “Regard your team as a family. Give the same attention to the bottom guy as you do the top guy. You have a responsibility to all of your players." PETE NEWELL: "I believe you can never change a habit, or create one, with a word or a piece of chalk. You can talk all day, put all sorts of diagrams on the board, but a habit is not going to change. It's a conditional reflex, created by a repetitive act. Habits are created through physical acts." JOHN WOODEN: "Talent is God given. Be humble. Fame is man-given. Be grateful. Conceit is self-given. Be careful." BOB KNIGHT: "Imagination is one of the most important things a basketball player can have. If you don't have an imagination, then it's very difficult to recognize and anticipate." The following comes from "Time Power" written by Brian Tracy -- one of the five best books I've ever read on time management principles and solutions. 1. Think on paper. Prepare thoroughly. List every step of the job in advance. 2. Gather all the materials and work tools that you will need before you begin. 3. Do one small thing to get started. 4. “Salami slice” the task. Sometimes the best way to complete a major job is to take a small slice and complete just that piece, just as you would take a single slice of salami and eat it. 5. Practice the Swiss cheese technique. Just as a block of Swiss cheese is full of holes, you treat your task like a block of cheese and you punch holes in it. 6. Start from the outside and complete the smaller tasks first. 7. Start from the inside and do the larger tasks first. Discipline yourself to start with that item, and stay with it until it is complete. 8. Do the task that causes you the most fear or anxiety. 10. Think about the negative consequences of not doing the job or completing the task. 11. Think about how you will benefit from doing the job and completing the task. 12. Set aside fifteen minutes during the day when you will work on your project. 13. Resist the tendency toward perfectionism. Since perfectionism is a major reason for procrastination, decide not to worry about doing the job perfectly. 14. Pick one area where procrastination is hurting you. 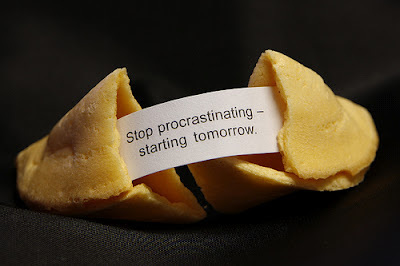 Select a single identifiable area where you know your tendency to procrastinate is holding you back. Pick the most important area, and resolve to conquer that specific example of procrastination. 15. Develop a compulsion for closure. Once you have launched and begun to work on your task, refuse to stop until it is completed. 16. Maintain a fast tempo. Fast tempo is essential to success. Resolve to work at a brisk pace. Walk quickly. Move Quickly. Write fast. Act quickly. Get on with the job. Consciously decide to speed up all of your habitual actions. • Pay attention to every day. Stop worrying about all that other stuff and start paying attention to the stuff that really matters. Live each day to the fullest. • Nothing has ever been accomplished in any walk of life without enthusiasm, without motivation, and without perseverance. • I can’t guarantee that if you work hard you’ll be successful, but I can guarantee that if you don’t work hard, you will not be successful. • It took me 10 years to understand the relationship between work and success. I thought if you work hard, you succeed. That’s wrong. Everyone is working hard. The truth is, if you don’t work hard, you won’t be successful. If you do, you just improve your chances. Understanding this helps you deal with failure. I’m not saying each one of us has the world in his hands. There is going to be a lot of failure. But failure is essential to success. 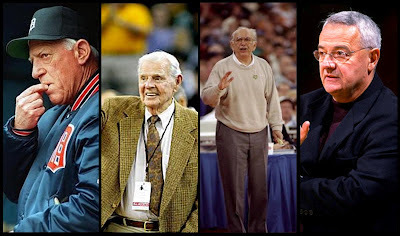 JOHN WOODEN: “It's the little details that are vital. Little things make big things happen." GENO AURIEMMA: "I tried to explain to my players it's impossible to be perfect, but we can try hard every day to be as close as we can. If you could only see all that goes into this, it's unbelievable." BILL WALSH: "One of your responsibilities is to generate interest in and excitement for a given matter among your players. The most effective way to accomplish such an objective is to utilize a high level of energy and show ardent enthusiasm for the subject when discussing it with your players." DON SHULA: "If you don’t seek perfection, you can never reach excellence." 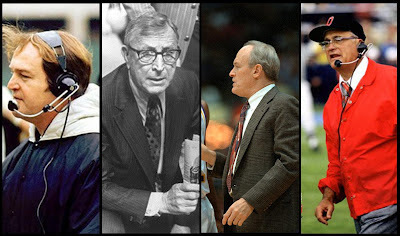 JOHN WOODEN: “It isn't what you do, but how you do it." 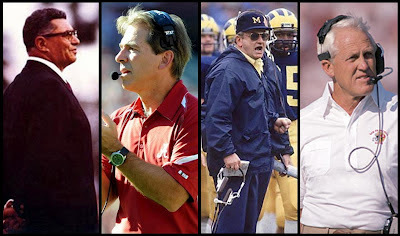 BO SCHEMBECHLER: "I say, whatever your philosophy, whatever your standards, whatever your expectations, you establish those on Day One. Don’t waste a second! Let them adjust to you, not the other way around. You can always soften up if you need to, but you can’t get tougher later on." 1. Remove distractions: Removing distractions is no small matter in our current culture, but it’s critical. How do you do it? First, by maintaining the discipline of practicing your priorities. Don’t do easy things first or hard things first or urgent things first. Do first things first—the activities that give you the highest return. Second, insulate yourself from distractions. I’ve found that I need blocks of time to think without interruptions. I’ve mastered the art of making myself unavailable when necessary and going off to my “thinking place” so that I can work without interruptions. 3. Keep items of focus before you: Ralph Waldo Emerson, the great transcendental thinker, believed, “Concentration is the secret of strength in politics, in war, in trade, in short in all management of human affairs.” To help me concentrate on the things that matter, I work to keep important items before me. I’ll also keep a file or a page on my desk so that I see it every day as I work. • Clear enough to be kept in focus. • Close enough to be achieved. • Helpful enough to change lives. 5. Question your progress: Take a good look at yourself from time to time to see whether you are actually making progress. 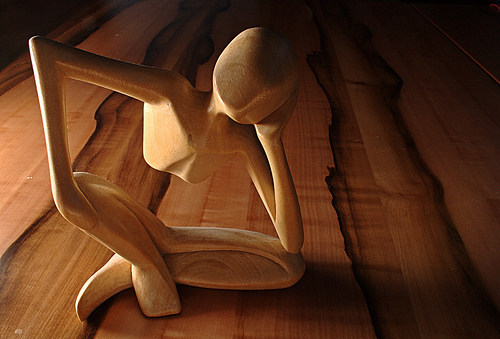 That is the most accurate measure of whether you are making the best use of focused thinking. 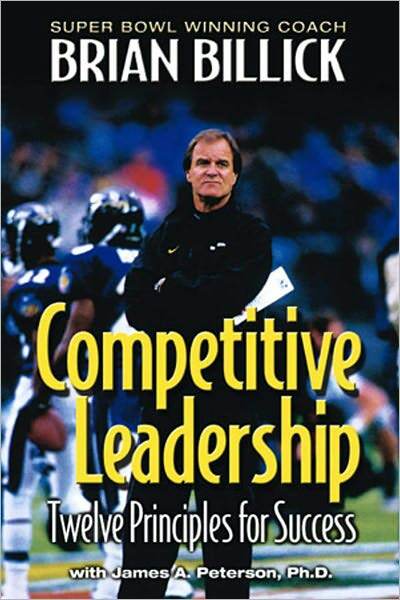 This is a series of thoughts from "Competitive Leadership: 12 Principles for Success" by Brian Billick. Part XII deals with being self-assured. To a point, self-confidence and leadership are interconnected. Self-assured leaders inspire confidence in others. As the level of confidence in the leaders rise, the likelihood that their followers will accept their leadership and act and behave as they want them to increases. As the leader in any field, when you stand before your followers you do so knowing full well that at that very moment, you will be under constant and incessant scrutiny. Every one of your decisions will be questioned, criticized, and second-guessed. Self-assurance is not the conviction that things will always turn out the way we want or planned, but that there are reasons that make sense regardless of how it turns out. If you let the critics, pundits, and experts act as the litmus test for your sense of self-worth, you are doomed to utter failure, for these individuals will never be satisfied. Physical courage is courage in the face of personal danger, while moral courage is courage or responsibility to others or to a purpose. The latter is what will sustain you best in the face of never-ending expectations. If the result of your confidence and convictions is nothing more than self-aggrandizement, such a self-serving goal will eventually fail you. On the other hand, I am not attempting to imply that a leader, in order to succeed, does not have to have a healthy ego. I am a firm believe in ego...by pure definition, is the need to distinguish ourselves from others...if I have one fear, it is living a life that common. I want to distinguish myself from others...I don’t mind being egotistical as long as it doesn’t lead to being self-centered, self-serving, and selfish. Almost every leader will have to deal with at least one significant setback in their career. The more capable they are of handling negative circumstances, the better able they will be to bounce back from any situation. Leaders who ascribe to the tenets of competitive leadership tend to see the positive side of things. Their vision enables them to frame issues in a constructive, rather than a negative, manner. BILL PARCELLS: "Not every team has enough talent to win the Super Bowl, but any competent coach can field a team that is strategically sound, that plays with discipline, that doesn’t beat itself. 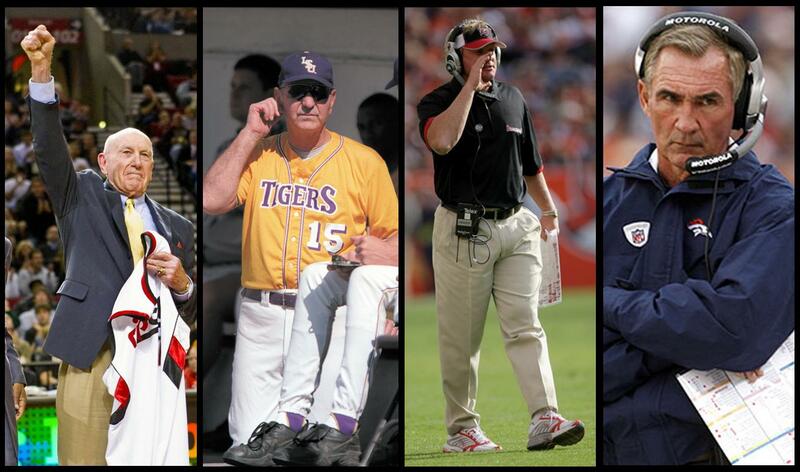 If any of those components are missing, it’s the coach who must be held accountable." BOB KNIGHT: "If we don't force our players to react to things: if we don't put them in tough situations, then it's our fault they can't react to them in ball game." 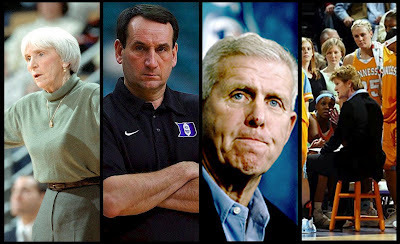 MIKE KRZYZEWSKI: “I'm a basketball coach all the time. That's what I do. I don't play golf. I chase my dog, or he chases me, and I whack down some trees and bushes and play with my grandkids and drink a little bit of wine." MUFFET McGRAW: "It's also difficult for me to respect anyone who tries to undermine the team, and, unfortunately, it only takes one player with a bad attitude to destroy team chemistry." PAT SUMMITT: "The foremost thing we require from our players, before anything else, is that they make good eye contact...eye contact is a sign." The best thing I enjoy about twitter is the vast amount of knowledge out there that can be acquired. There are so many experts in the twitter universe willing to share their expertise and we are all fortunate enough to benefit for the servant attitude. 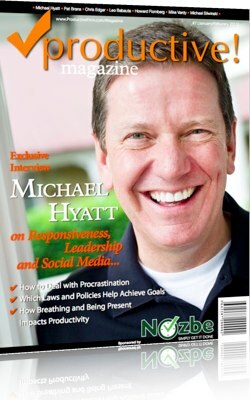 One of my favorite to follow is @MichaelHyatt by none other than Michael Hyatt. He passes on a wealth of knowledge in various areas including thoughts and concepts on "intentional leadership." He also has one of the best blogs out there and I highly recommend to all. This is just the introductory portion of Michael's post on this subject -- the meat and potatoes are to follow and you can (and should) read the entire post her: http://bit.ly/GGQAkh. I promise you won't be sorry! Okay, it’s happened: 10,000 hours is officially in the mainstream. Athletes, musicians, students, businesspeople are counting away, waiting for their practice odometer to tick over and — presto! — they’ll be world-class experts. Sorry, but that ain’t how it works. Why? Because when you count the hours, it’s easy to lose track of the real goal: finding ways to constantly reach past the edge of your current ability. The real lesson of 10K is not about quantity; it’s about quality. It’s about getting the maximum possible gain in the shortest amount of time — and to get that, you don’t focus on the time, but on the gain. You put your focus on improving the practice, which happens two ways: through better methods or increased intensity. 1. Certain kinds of learning — deep, or deliberate practice — are transformative. 2. That transformation is a construction process. 3. That construction process depends on your intensive reaching and repeating in the sweet spot on the edge of your ability. You are what you count. 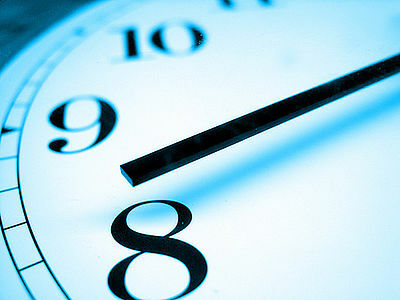 If you count hours, you’ll get hours. But if you find a good way of measuring your intensity, or measuring your improvement, that’s what you’ll get. It is a makeup now rooted in his Marquette basketball players, who Murray State Coach Steve Prohm said look like a parade of linebackers or defensive backs without shoulder pads and helmets. After watching Marquette before a second-round NCAA tournament matchup, Prohm joked to his team that the Golden Eagles look like they all should be in spring practice at Alabama or Louisiana State. After Marquette muscled its way past sixth-seeded Murray State, 62-53, the Golden Eagles sat in a locker room — some wearing ice packs, others wearing knee pads — as if halfway through a two-a-day football session in August training camp. And Todd Smith, the man most responsible for instilling gridiron attributes, stood with arms folded and his back to the wall. Players pull 250-pound sleds. They climb rope until fingers blister. They slip their fists into boxing gloves and pound a body bag. And they use a real football and play a variety of football-related games, rotating quarterbacks in the two-hand touch matchups to keep things fair. At first, Smith said, players want to quit. Some throw up. But the team’s weight room is not nicknamed “The Confidence Room” for nothing. Perhaps no Marquette player has made bigger strides in conditioning and confidence than junior point guard Junior Cadougan, who ruptured his Achilles’ tendon as a freshman. “It is just a crazy, radical situation,” Cadougan said. “It’s torture, but it’s from the heart, it’s love. He is not doing it to torture our bodies, but to prepare us for situations like this” in the NCAA tournament. A big reason Williams already has had conversations with several NFL teams about Crowder potentially trying out is because of the skills the sculpted 235-pound senior honed in Smith’s offseason program. 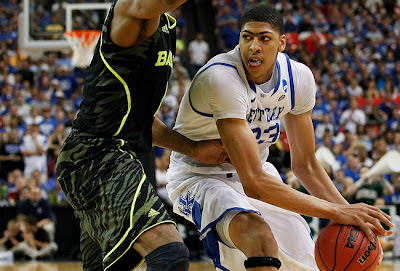 “He just kills you,” said Crowder, the Big East player of the year. After players survive the summer program, they prepare for two more phases before traditional basketball practice begins in mid-October. There’s individual work with Williams, and there’s the early October “Boot Camp,” 12 sessions that include various forms of two activities: running fast and running faster. Players said the offseason work has steeled them mentally and physically for the NCAA tournament. Wilson said he saw Murray State’s big men fatigue in the final minutes of the round-of-32 game. Following a victory over rugged Florida State on Sunday, Cincinnati’s Yancy Gates called the Seminoles physical, but certainly no more so than some Big East teams, namely Marquette. What the Golden Eagles lack in Florida State-like size, they make up for in strength and power. 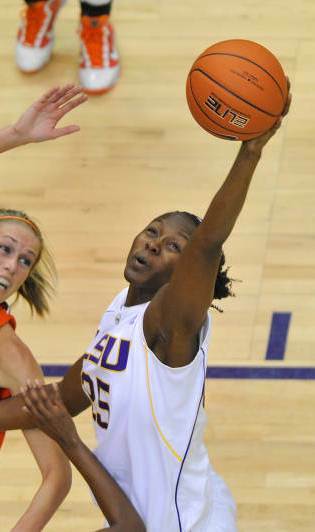 Excuse me, if you don't mind me drifting from the beaten path this morning, but thought I would take a little different direction on my blog with some commentary about a special group of young ladies -- the 2012 Senior Class of the LSU Lady Tigers. Last night LaSondra Barrett, Swayze Black, Destini Hughes, Courtney Jones and Taylor Turnbow battled one last time together, as Lady Tigers. The result was a hard-fought 90-80 loss to #11th ranked Penn State. You could frame the accomplishments of these five special ladies by looking at their record on the court and come away being impressed. They posted an overall 82-45 record, averaging over 20 wins a season, playing in the tough SEC along with competing against the nation's best in non-conference play. They averaged over 9 SEC wins a year. Their SEC total over 4 years sits at 37 wins, topped only by Tennessee with 52 and Vanderbilt with 38.Without question, LSU's SID Bill Martin could real off a lot of team and individual accomplishments. But those outstanding numbers don't begin to weave the proper story of their achievements. I had the privilege of coaching this group for three years at LSU and one of our constant themes throughout the years was "Leaving a Legacy." It was a concept that started with our Final Four runs through the work of Felicia Hall Allen who came to work with our teams. She did an amazing job because the players grabbed that concept -- it meant a lot to them in terms of how each group of seniors left the program for the next season. Boogie, Swayze, Destini, Courtney and Taylor came to LSU in a great time of turmoil. Our program was climbing out of a scandal and we were looking for talented basketball players and quality people to help rebuild. We had a new staff and were graduating nine seniors. 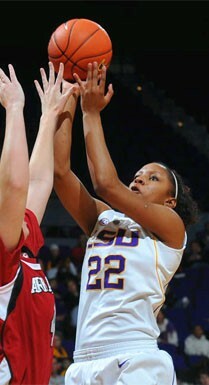 We weren't looking for a few recruits -- we were looking for an entire team -- the new future of Lady Tiger Basketball. 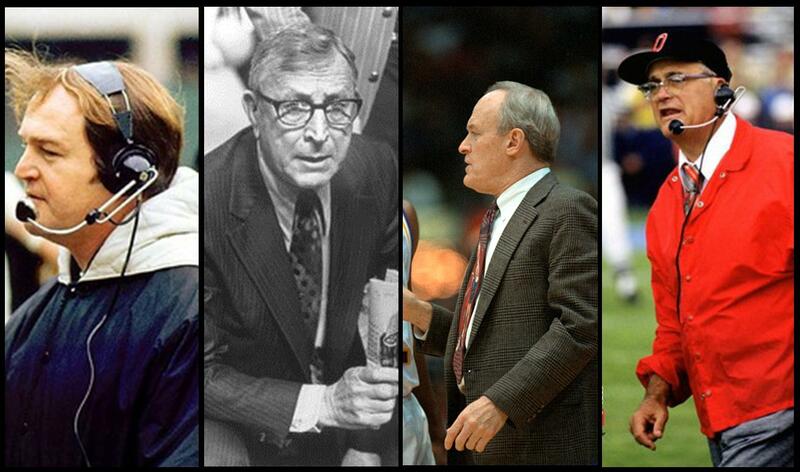 They weren't the only five we signed that year -- but they are the ones who stayed and cemented their legacy. 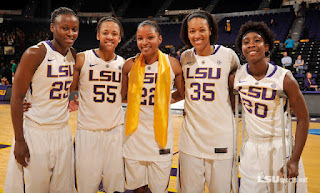 What makes these young ladies special is that they took a chance on LSU...they said that despite the adversity and challenges they "wanted to be Lady Tigers!" And for that, I -- and a lot of other LSU alumni and fans -- will be forever grateful. And they hit the ground running! Their first game wearing the LSU uniform we played nationally ranked Notre Dame with two of them starting and all five playing significant minutes. 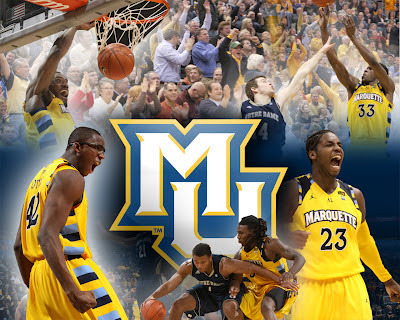 Other non-conference games their freshman year included nationally ranked Xavier, Florida State and Nebraska. And then there was a trip to Connecticut on national television -- a close game until the final minutes before losing by 13. 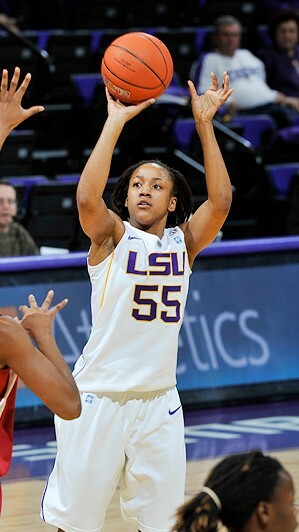 There was a five-game winning streak to close out the SEC portion of play including a victory over Tennessee. 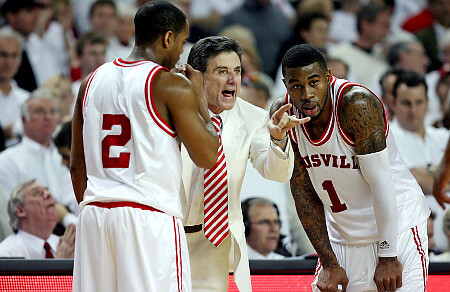 A first-round NCAA win over Wisconsin-Green Bay was followed by a close loss to eventual Final Four team Louisville. It was an amazing season for a group of freshman! But again, that's only part of the story. They have all gone through personal adversity on and off the court. They are separately unique individuals. Boogie is an amazingly competitive person with a great basketball IQ. Swayze is an amazing athlete but an incredible teammate that might be the most admired among the group. Courtney has a charming personality and enthusiasm on and off the court that can be contagious. Destini is a very spiritual person that cares deeply about people (and animals). 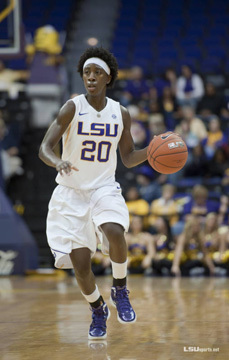 Taylor is a unique young lady that cares more about playing defense than being a scorer. A common denominator? They all came from great families -- that makes a difference! Together you have five outstanding students. Some graduated early -- the rest will graduate this spring. No discipline problems. They care about each other. They have a great appreciation for the alumni whom steps they have followed in. They were wonderful in community service. They respected and loved the great fans of LSU. They are now alums! 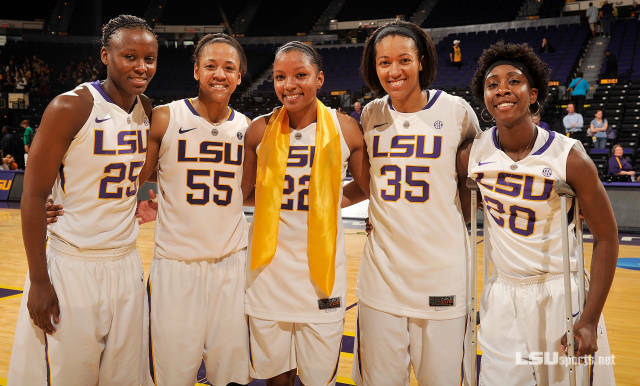 When you look to the rafters of the PMAC, this class will not have hung a Final Four banner but I guarantee that the next time it does happen, I hope that someone mentions the role of these five seniors. They will have been the glue in a tumultuous time. Just as Katrina Hibbert, Latasha Dorsey, Marie Ferdinand, Elaine Powell, Keia Howell, Cornelia Gayden, and many more never hung a a Final Four banner -- they created a culture of excellence and started the legacy that lead to the Final Fours. I am very proud of all five -- not just as basketball players -- but as young women! Your legacy will live forever! I am also thankful for the current LSU staff who came in and blended them in such a way that they could finish out their careers with a very successful season. "I am extremely proud of our team to battle all the adversity that has been sent our way and for pulling through. To me it is a lot bigger than basketball, it is more personal with these girls because of the relationship we have and knowing that everyone's heart is in it. I don't look at my senior season being defined by a Penn State loss, I look at all of the other stuff whether it was us having to battle after Destini's (Hughes) injury or me having to play point guard or all the other personal stuff we had to go through. Those things are what I look at and those are what I will remember as highlights in my future." WHAT DO YOU DO TO GROW YOUR SPORT? "HE (IZZO) DOESN'T CHANGE. GUYS GROW UP"
DOES YOUR ASSISTANT COACH HAVE YOUR BACK?